Johan August Strindberg (January 22, 1849 – May 14, 1912) was a Swedish writer, playwright, and painter. He is ranked among Sweden's most important authors. 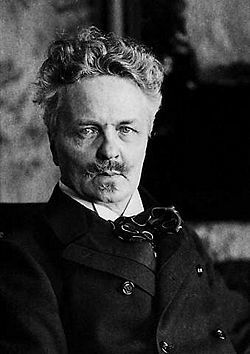 Strindberg is known as one of the fathers of modern theater. His work falls into two major literary movements, Naturalism and Expressionism. Strindberg's earlier plays were import works of Naturalism, but in his later career, he moved away from the strict representation of Naturalism, which developed in the late nineteenth and early twentieth centuries. It refers to theater that tries to create a perfect illusion of reality through detailed sets, an unpoetic literary style that reflects the way real people speak, and a style of acting that tries to recreate reality (often by seeking complete identification with the role, as advocated by Stanislavski). In later plays, like "A Dream Play," Strindberg's style became more Expressionistic. Expressionism refers to the tendency of an artist to distort reality for an emotional effect; it is a subjective art form that was a complete break with the representational ethic of Naturalism. The term may apply to any emotional expression, but it was particularly associated with the expression of angst. Taken as a whole, Expressionism reflects a revolt against some of the dehumanizing aspects of modern, urban culture. 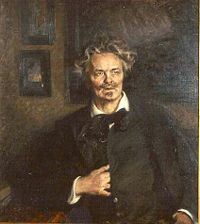 Born in Stockholm, Strindberg was the fourth son of Carl Oscar Strindberg, a shipping agent from a bourgeois family, and Ulrika Eleonora (Nora) Norling, a woman twelve years younger, whom Strindberg called a "servant woman" in the title of his autobiographical novel, Tjänstekvinnans son (The Son of a Servant). His paternal grandfather Zacharias was born 1758, as the son of a clergyman in Jämtland, and having settled in Stockholm, he became a well-to-do spice tradesman and a major in the Burghers' Military Corps. Strindberg's aunt, Lisette, was married to the English-born inventor and industrialist, Samuel Owen. Carl Oscar Strindberg's older brother, Johan Ludvig Strindberg, was a successful businessman, and has been seen as the model for the main protagonist, Arvid Falk's, wealthy and socially ambitious uncle in Strindberg's novel, Röda rummet (The Red Room). From the age of seven, Strindberg grew up in the Norrtull area on the northern, still almost rural, periphery of Stockholm, not far from the park where Carl Eldh's Strindberg statue was later placed (Tegnérlunden). He went to the elementary schools of Klara and Jakob parishes, then to the Stockholm Lyceum, a progressive private school populated by boys from upper and upper middle class families. He completed his studentexamen, or graduation examination on May 25, 1867, matriculating to the University of Uppsala in the fall of the same year. Off and on for several years he spent his time in Uppsala or at home reading for examinations to be taken in Uppsala, but also trying other things. He first left Uppsala in 1868, to work as a schoolteacher, studied chemistry for some time at the Royal Institute of Technology in Stockholm in preparation for medical studies, worked as a private tutor, and was an extra at the Royal Theater in Stockholm. He returned to Uppsala in January 1870, and began working on a set of plays. 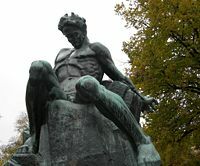 The first, on the Danish sculptor Bertel Thorvaldsen, opened at the Royal Theater in September 1870. In Uppsala, he started a small literary club, Runa, with some friends, all of whom took pseudonyms from Nordic mythology; Strindberg called himself Frö after the god of fertility. He spent a few more semesters in Uppsala, finally leaving in March 1872, having never graduated. He would often hold Uppsala and its professors up to ridicule, and a few years later published Från Fjerdingen och Svartbäcken (From Fjerdingen and Svartbäcken, 1877), a set of short stories depicting Uppsala student life. After leaving university for the last time, he started a career as a journalist and critic for newspapers in Stockholm. Strindberg was married three times, to Siri von Essen (1850-1912), Frida Uhl (1872-1943), and finally Harriet Bosse (1878-1961). Though he had children with all of them, his hypersensitive, neurotic character led to bitter divorces. Late in his life he met the young actress and painter, Fanny Falkner (1890-1963), who later wrote a book about his last years, but the exact nature of their relationship is debated. He had a brief affair in Berlin with Dagny Juel before his marriage to Frida; and it has been suggested that the shocking news of her murder might have been the reason for his canceling the already postponed honeymoon with his third wife, Harriet. Strindberg's relationships with women were troubled, and his legacy of words and deeds has often been interpreted as misogynist by both his contemporaries as well as modern readers. However, most acknowledge that he had uncommon insight into the hypocrisy of his society's gender expectations, sexual behavior, and morality. Marriage and the family were under stress in Strindberg's lifetime as Sweden industrialized and urbanized at a rapid pace. Problems of prostitution and morality were debated heatedly among writers and critics as well as politicians. His early writing often dealt with the traditional roles of the sexes imposed by society, which he criticized as unjust. Strindberg was admired by the working classes as a radical writer. He was a Socialist (or maybe more of an Anarchist) and his daughter, Karin Strindberg, married Vladimir Mikhailovich Smirnov, one of the leading Russian Bolsheviks. For his political standpoints, Strindberg has been heavily promoted in socialist countries, such as the Soviet Union, Central and Eastern Europe, and in Cuba. It is not so widely known that he also was a telegrapher, painter, photographer, and alchemist. As a young student, before he became a writer, he worked for a while as an assistant in a chemist's shop in the university town of Lund in southern Sweden. On his death in 1912, from cancer at the age of 63, August Strindberg was interred in the Norra begravningsplatsen in Stockholm. There are several statues and busts erected of him in Stockholm, most prominently one by Carl Eldh. 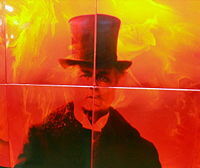 His novel, The Red Room (Röda rummet) (1879), brought him fame. His early plays were written in the Naturalistic style, and his works from this time are often compared with the Norwegian playwright Henrik Ibsen. Strindberg's best-known play from this period is Miss Julie (Fröken Julie). Later, he underwent a time of inner turmoil known as the Inferno Period, which culminated in the production of a book written in French, appropriately entitled Inferno. Afterwards, he broke with Naturalism and began to produce works informed by Symbolism. He is considered one of the pioneers of the Modern European stage and Expressionism. The Dance of Death (Dödsdansen), A Dream Play (Ett drömspel), and The Ghost Sonata (Spöksonaten) are well-known plays from this period. A Dream Play (Ett drömspel) was written in 1901, and first performed in Stockholm, on April 17, 1907. It remains one of Strindberg's most admired and influential dramas, seen as an important precursor to both dramatic expressionism and surrealism. The primary character in the play is a Vedic goddess of sorts, Indra's daughter, who visits Earth to bear witness to our problems. Strindberg wrote it following a near-psychotic episode. During that time, he came to be extremely disturbed, thinking witches were attempting to murder him. He later wrote a memoir about this period of his life. Eventually, though, he recovered, thanks to his mother-in-law. The play itself represents a change in his style, one that would have widespread influence on the development of modernist drama. Strindberg used the dream as a setting in this theatrical work to address realistic concerns such as materialism, class struggle, gender role struggle, and the destruction of traditional marriage. In his preface, he addresses his use of "the disconnected but apparently logical form of a dream." Eschewing realism, Strindberg explained that he had modeled his play, not on the pattern of cause and effect that had characterized the well-made play, but on the associative links found in dreams. In the play as in a dream, he explains "Anything can happen; everything is possible and probable." Locales dissolve and give way to each other; time both moves forward and backward. During the course of the play, a castle grows up in the garden, as if it were a plant. At the play's end, it burns, revealing a wall of suffering and despairing faces, then blossoms at its top in a huge chrysanthemum. In addition to the non-linear plot, it is also groundbreaking in its treatment of character. It doesn't center around a single, well-defined dramatis personae, but rather treats character as a product of the narrative flow, presenting a character who seems to be a combination of different professional men, all confused. It also represents an early forecast of the problem of urban pollution. The play attracted some of the twentieth century's most celebrated directors, including Max Reinhardt, Olaf Molander, Antonin Artaud, Ingmar Bergman, Robert Wilson, Mike Dempsey, and Robert Lapage. "When is revolution legal? When it succeeds!" "What is economics? A science invented by the upper class in order to acquire the fruits of the labor of the underclass." "When they say Christ descended into Hell, they mean that he descended to earth, this penitentiary, this madhouse and morgue of a world." Works by August Strindberg at Projekt Runeberg (in Swedish). Works by August Strindberg. Project Gutenberg. August Strindberg Society of Los Angeles, Learn about the great Swedish dramatist at the TASSLA site; plays, discussions, photos, drawings, quotes and reviews. This page was last modified on 26 April 2016, at 23:13.